This year's 14th issue of Shogakukan's Weekly Shonen Sunday manga magazine announced on March 7 that Project ARMS writer Kyoichi Nanatsuki and Blade of the Phantom Master/Defense Devil artist Kyung-Il Yang are launching a new manga series. 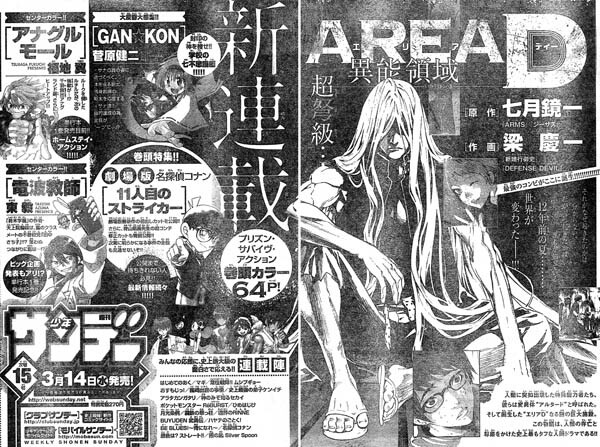 Area D - Inōryōiki will debut in the magazine's next issue on Wednesday. The "prison survival action" story is set after the sudden emergence of special powers in certain pockets of humanity. To deal with these so-called "Altered," a mysterious remote island prison named "Area D" was built. The first chapter will be 64 pages long, including a color opening page. Tokyopop published Yang's Blade of Heaven and Island in North America, while Viz published his March Story. Funimation released the title's anime movie adaptation after ADV Films had previously licensed it. Yang illustrated Defense Devil , which ran in Shonen Sunday from 2009 to 2011, and Nanatsuki's Project ARMS was also serialized in the magazine from 1997 to 2002. Viz Media released both the Project ARMS manga and anime.